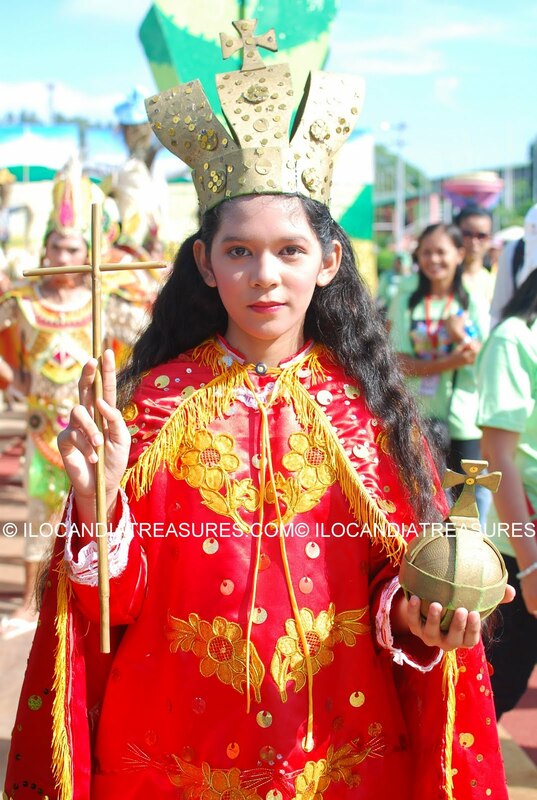 Ablan Day is celebrated August 09 of every year. 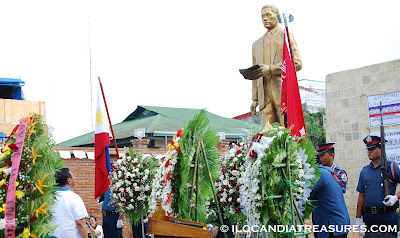 It is a non-working holiday throughout the province of Ilocos Norte by virtue of Republic Act 6941 which recognizes the occasion as a tribute to the undying love of the late Governor Roque Ablan, Sr. for his country. Ablan is considered as patriot and a World War II hero. He was elected as governor at age 31 and the youngest provincial executive of his time. He was the incumbent governor of the province prior to the grim war in 1941. 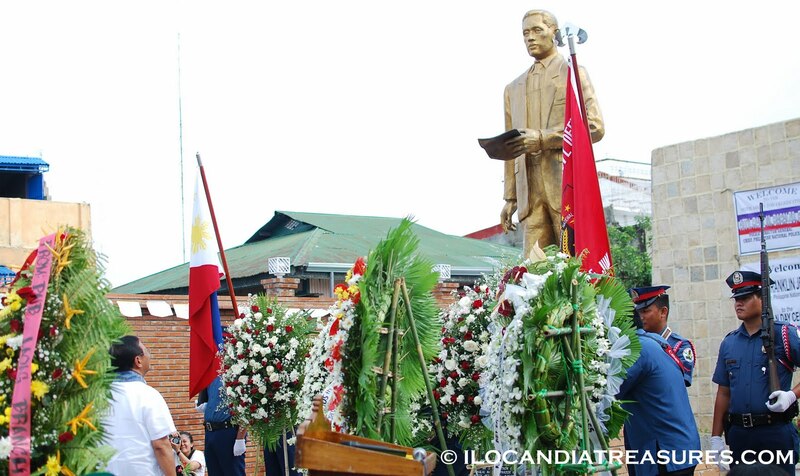 Vice-President of the Republic of the Philippines Jojomar Binay was the guest of honor and speaker during the celebration of the 105th birth anniversary of the late governor. 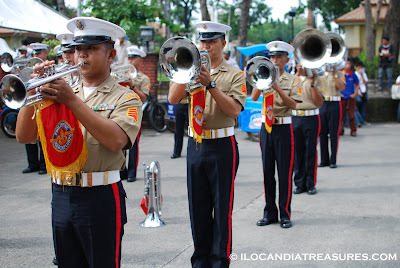 The highlights of the celebration were the wreath-laying ceremonies at the Ablan Shrine led by no less than the Vice President Binay, the conduct of civic parade led by students of the different universities and employees of the various local government units of the province and a program infront of the capitol where Congresswoman Imelda Marcos and Ilocos Sur Governor Chavit Singson made short speeches before the crowd. Dance performances were rendered by groups of students depicting the core values of the Ilocano leader and a finale of the exhibition of the Philippine Marine Corps. I encountered on the net that this week is the National Book Week in Australia. I was reminded that I attended the World Book and Copyright Day in Quezon City sponsored by the National Book Development Board and the Intellectual Property Office. World Book and Copyright Day is celebrated yearly every 23rd day of April. This is the day when the author Miguel de Cervantes died and declared as such to give him the honor because he was the famous Spanish novelist who wrote Don Quixote. He was also a poet and a playwright. This is also the date of death of English poet and playwright William Shakespear. This also coincides with Catalonia festivals. This International Day of Book was first celebrated in 1995. It is organized by UNESCO to promote reading, publishing and copyright. Buenos Aires was declared as World Book Capital for 2011 because its establishment of “Tower of Babel of Books” which was composed of 30,000 books from around the world in different languages. The books were donated by 50 countries that include Philippines which sent Noli Me Tangere and El Filibusterismo which became part of the art installation. The celebration for the Philippines was held at the UP-Ayala Land Technohub at Quezon City. It was a one day event. I was able to exhibit my book Around the Americas in 60 Days in the mini book fair and lucky to have sales. The mini book fair was participated by two book store outlets. There were publishers, authors and bloggers who were invited to be resource speakers during the event. Mrs Socorro Torres, general manager of the National Bookstore was the keynote speaker during the event and she delivered and inspirational talk. Copyright lawyers were there also to talk on the importance of copyright and a forum was made. There was an interesting topic discussed during the event and that was “The Making of a Bestseller: What Sells and What Does Not”. I became interested of it because I have my book to sell. A book illustration workshop was conducted by Adarna publishing house with a group of children. At the end of the program there was a film screening and an independent film was featured. The title of the film was Mondomanila. After three days of non-stop action in reaching the summit of Philippine’s highest mountain that is Mt. Apo, we were lucky to have spent two more days before we went back to Manila. I and Mai were able to machine washed our very soiled climbing gears and whatnot. We stayed at the convent. 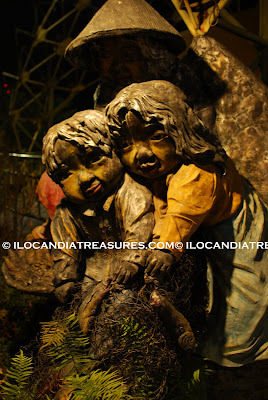 We did some night out with some friends by visiting the People’s Park, then we headed to the Matina Town Square where we had a few bottles of beer. On our second day, Fr. Ricky Acero toured us around Davao by driving us to the Jack’s Ridge. Its located on a elevated place overlooking the bay. There is a resto here where we had some halo-halo for snacks. 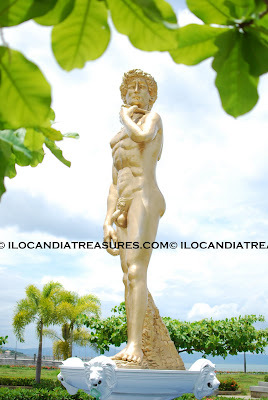 We proceeded to the controversial statue of David which is branded as one of the largests in the world. A motel was said to have sponsored the building of this statue. In the later afternoon, we attended the mass celebrated by Fr. Romeo Obach, in celebration of his 25th anniversary as a priest and his installation as the superior general of the Redemptorist community in Davao. There was dinner party at the convent and joined it. On the next day we had to rush to the Paradise Island for a quick tour. We have seen the nice white sand beach where you can just take a dip and relax. We have tried the durian ice cream and there was even a serenade of the customers in one of the restaurants. What a fun way to end our trip in Mindanao. After having our lunch we headed to the airport and Fr. Geo sent us off. 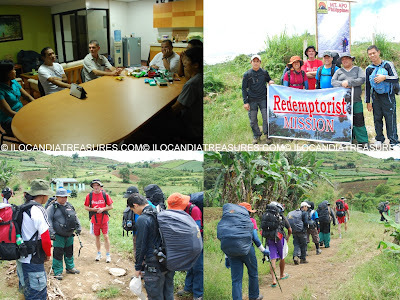 On the eve of our climb last April, Redemptorist prelates Fr. Ricky Acero, Fr. Geovanni Quibol, Fr. John Michael Salatandol, Fr. Columb Meany, Fr, Brian Espejo, lay missionary Ms Mai Sapinit and myself had a meeting regarding the climb at the living room of Fr Senen Javier at the Redemptorist convent in Davao City. Fr Ricky and Fr Geo explained to us what to expect at the trail and at the peak. It was now their third time to climb the said mountain. Fr. John gave us the trail foods. Each of us contributed a very minimal amount of money for the trek. We got even exempted from the entrance fee because our company was going on a religious mission up the peak. We were about to leave Redemptorist Convent at 4:30 in the morning but we were delayed because the butane supply could not be found at the dining area. Some people were asked but they did not see them. So we went out to look for hardware shops that we can buy butane. However, all the shops were still closed. We headed then to Digos City where we tried to ask some shops for butane but to no avail. Lucky that our guide/porter Winnie and Jun had at home four canisters of butane. We took our breakfast at their house. We commenced our climb from Kapatagan at Purok Mainit. We started at past 10am then we reached our base camp in Godi-godi at 5:30 pm. We spent seven hours trekking on vegetable plantations, muddy trail and inside the dark forests. We passed by some logs where we have to pass through some of them crawling underneath. We cooked our dinner at our camp at went to sleep. The following day, we woke up early and we saw the sunshine beaming on the foliage of trees. The trees were high and mossy. We had our coffee and breakfast and broke our camp later. We started to take assault of the summit or peak passing through the boulder face. From Godi-godi camp, we stepped on to many rocks and stones which might be difficult for some but it was enjoyable for me because of the beautiful sight. I have to step up and down and take a lot of balancing. We saw a smoke or steam coming out in the midst of boulders on one side. This is what they call soltafaras or fumarole which emits sulfurous gases. Getting closer we saw yellowish rocks which emits sulfur dioxide. It really gave a nice photographic view. Upon passing through the boulder face, we reached a point where we saw the dead crater. What a fantastic view in here. Theres a shallow water in which the high rocks reflects on it. We had a photo op here. Just a few more steps or climb, we reached the summit of Mount Apo. This mountain is the highest peak in the Philippines with an altitude of 2, 954 meters or 9,692ft. 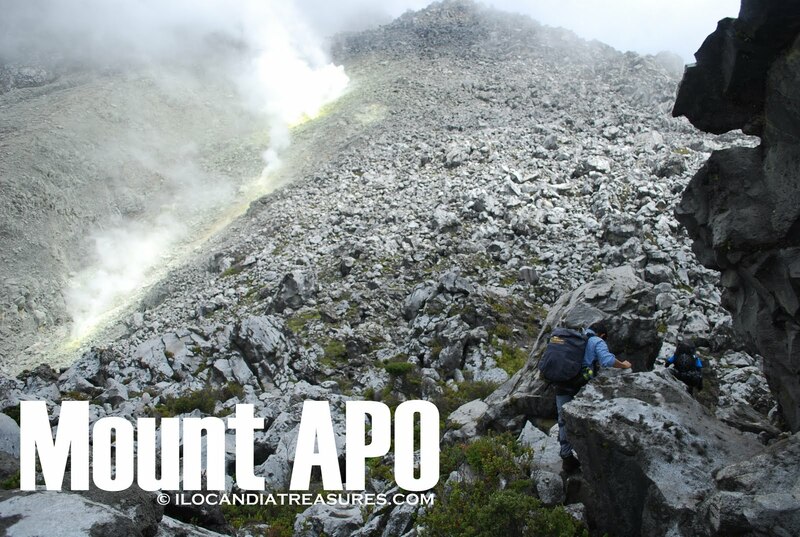 Its name Apo denotes ancestor or it is called the Grandfather of Philippine Mountains. It is a large soltafaric and potentially-active stratovolcano.It has a flat top with three peaks capped by 500 meter wide volcanic crater. The peak overlooks Davao City to northeast, Digos City to the southeast, and Kidapawan City to the west. We settled on a camp below the peak but it rained so hard at an instant. It’s good that our guides had already fixed our tents before we came in. Our guides were able to seize the small cave we used for our cooking. The rain stopped for a while and rained again. So the priests decided to hold the mass inside the tent. Fr. Coulumb Meany celebrated the mass. Each one of us did some sharing. 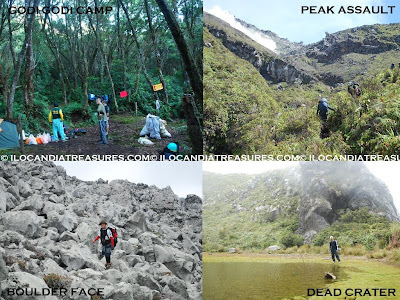 We expressed the feeling we felt in reaching the summit of Mount Apo. It was such a remarkable feat. We have endured all the obstacles along the way. After the mass, we finished the mompo. Then we had dinner at the cave. It was windy in the night and it was still drizzling. The early morning was chilly one. It was so foggy. We took our breakfast before we headed for our descent. We went down but the trail was so muddy and slippery. We spent some time to go down and reached a beautiful site of the Lake Venado. It was incredibly wonderful. You would think that overlooking it was already close to it but it took more descending steps to make before getting to it. By the time we reached the lake, I ran and took a dip in the water. 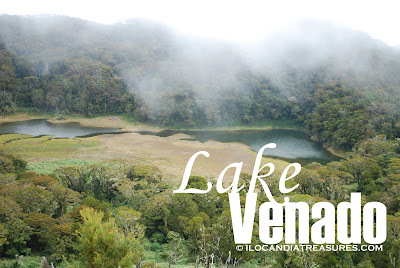 I was the only one who tried the water of Lake Venado. I took a dip in the water, just what I usually do in every trek. It was cold. 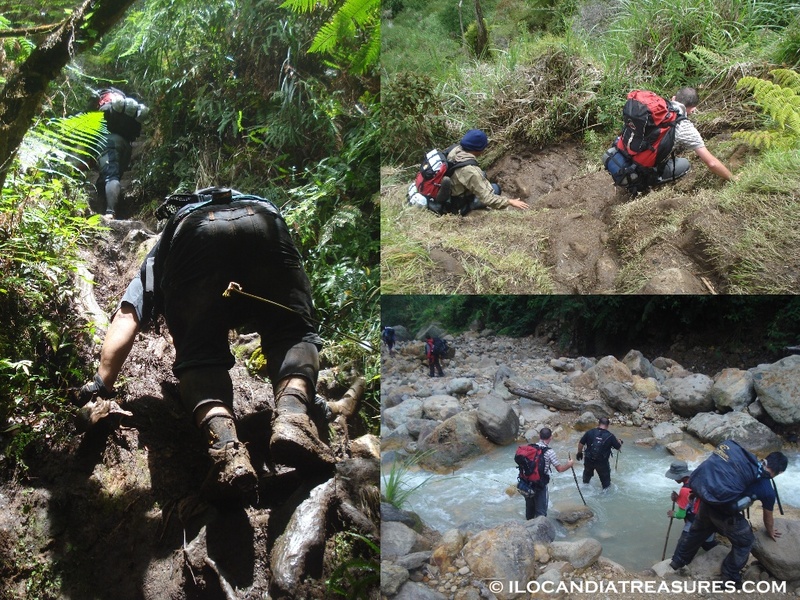 We have to cross the lake in order to get to the other side and continued the trek adventure. After a break in the lake, we continued trekking for some more. We had to pass through again forest the crossed several parts of river. It was really such a tedious trekking. 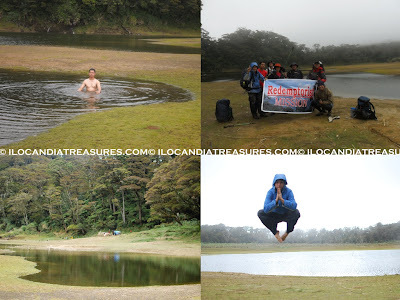 Then after ten hours of trek, we got off to Kidapawan where we took a bath in the Agko natural spring. What a way to end our moving legs. We were served with a hearty dinner then we had jamming with some Kidapawan friends of Fr. Brian namely, Joan, Ian, April & Dr. Anthony. A travel is not complete without sampling the local delicacies of a place. Food is always a part of the culture of the people. They are what they eat. 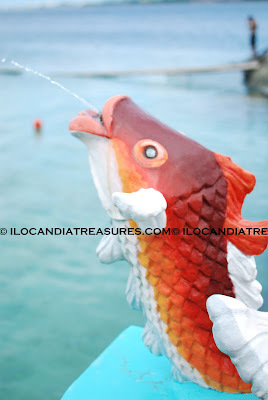 The province of Leyte being in the coastal areas in the Visayas region abounds with so many delicious foods. One of which is the seafood for meals. Aside from this, they have the kakanin or snacks made originally in Leyte. These are the binagol, sagmani and moron. 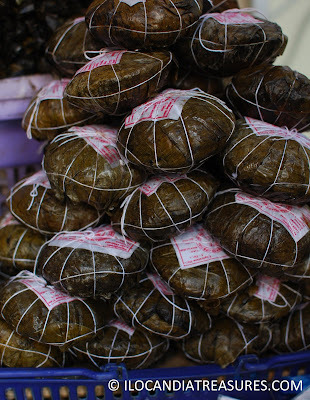 Binagol is made of sweetened taro and nuts. They call talyan the variety of taro or gabi species endemic in the locality. 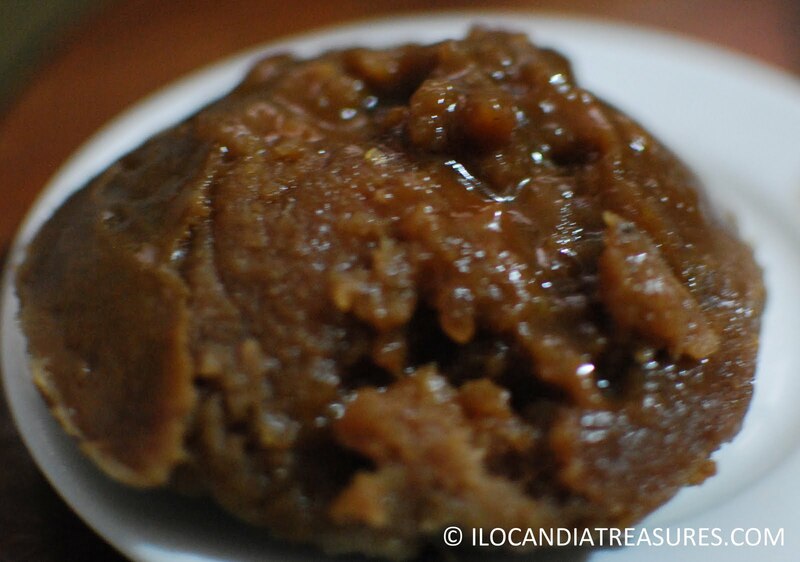 It is grounded and mixed with eggs, coconut milk, sugar, butter and chocolate. The mixture is later placed in coconut shell which is called bagol where the term binagol was taken. 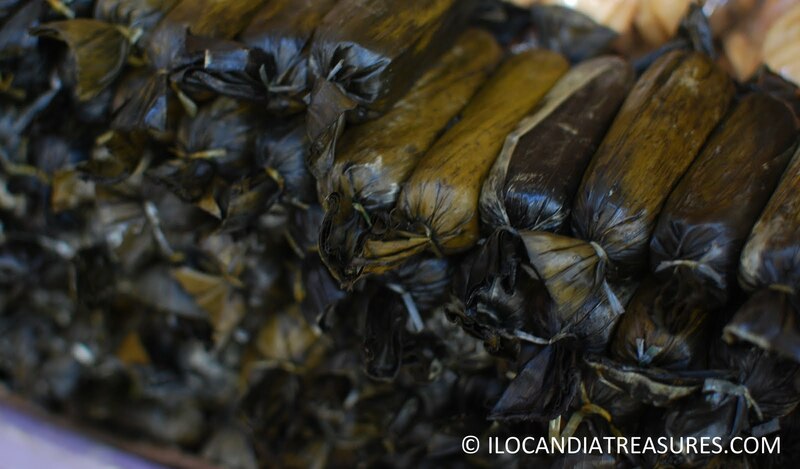 It is then wrapped in a banana leaves and steamed. I bought binagol at a price of 3 pcs for 100 pesos. Sagmani is another delicacy which is less popular among the delicacies. It is made of cassava, gabi or sweet potatoes cooked with coconut milk sugar and coconut meat. It is quite similar to binagol. Moron is another delicacy similar to suman but with chocolate flavor. 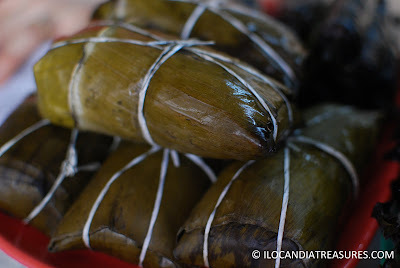 These food are truly of wonderful taste and excite my palate everytime I come to Tacloban. These are perfect for pasalubong. I was lucky enough to have booked a fare of 600 pesos all-in one way ticket when Philippine Airlines offered promotional sale Laoag to Manila to Tacloban City and back. That’s a big saving. 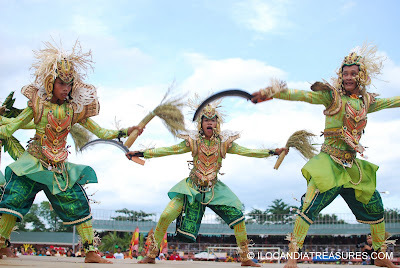 I did a research on Pintados but I was reluctant towards the date since it falls on Monday. Usually festivals are scheduled on weekends. I also heard an issue on the dispute regarding the holding of the celebration in the city. I flew in to Tacloban City early morning of June 27 and headed straight to the venue. I met some staff of the organizing committee. They gave me a festival shirt and a cap made of dried coconut leaves. I saw Mayor Remedios Petilla at the stage and paid a courtesy call to her. I personally met her when she was still a congresswoman the first time I went to Tacloban through a mutual friend. She related to me the issue and she’s glad that it was going to push through. 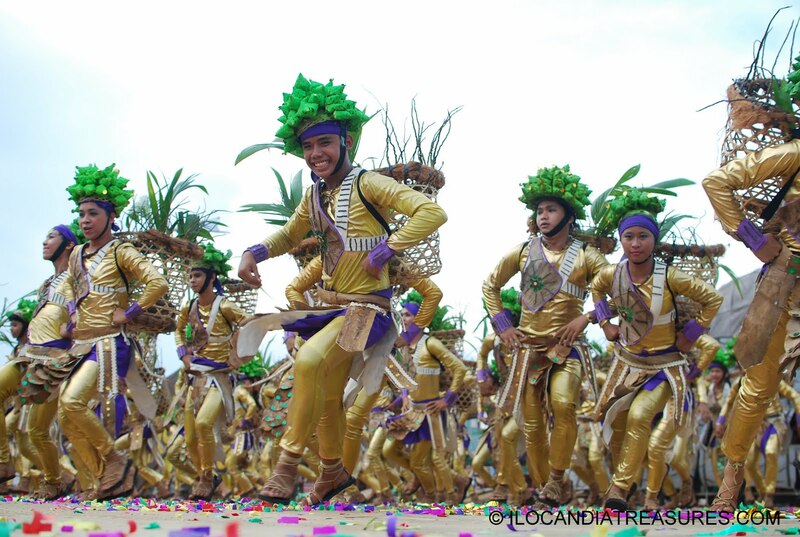 Pintados-Kasadyaan is a festival of festivals. 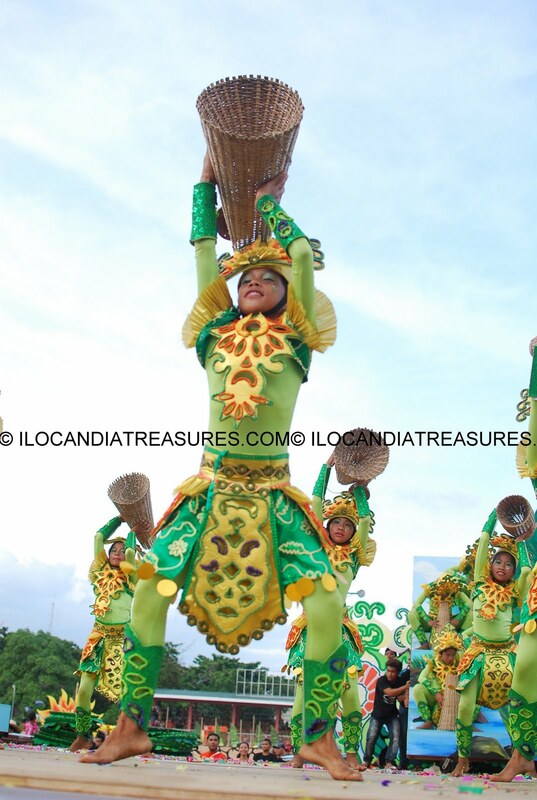 It is participated in by the different towns of the province of Leyte showcasing their respective festival. It was first officially started in 1987 and in 1996 it was led by then former Governor Remedios Petilla. 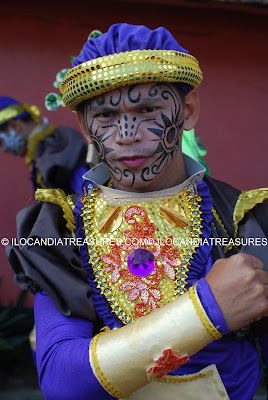 Back in the ancient times when Spaniards came to the Visayas, they saw heavily tatooed men and women whom they called Pintados. According to history they had their own unique culture and way of honoring their gods after a bountiful harvest. 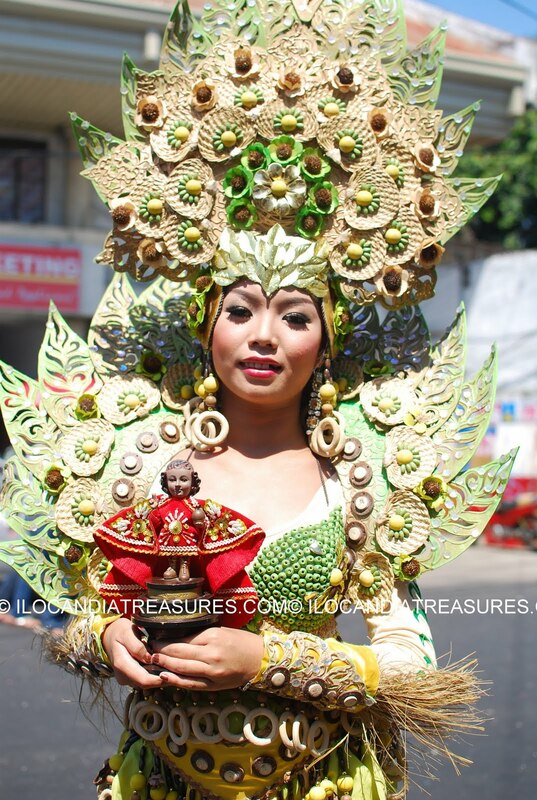 The Spaniards introduced Christianity to the country and they incorporated the honoring of the image of Senor Santo Nino. Pintados were the native warriors who sport heavy tatoos on their bodies which served as status symbol and beauty for them. It also exemplifies strength and braveness. Meanwhile, the Kasadyaan word would mean merriment in the Visayan dialect. 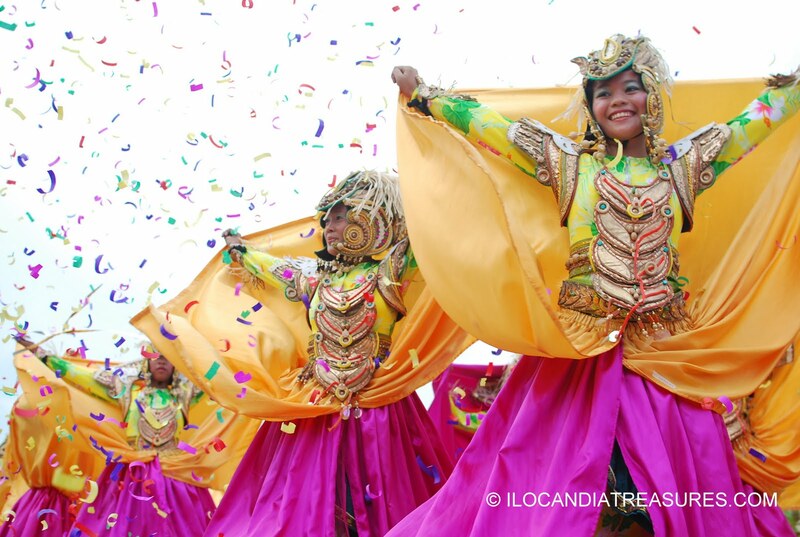 This festival is a showcase of the rich cultural heritage of the province highlighting the native music and dances. They started the grand parade from the stadium where I began to document. 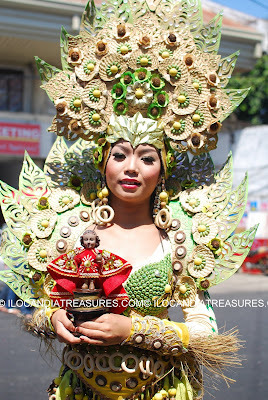 I saw different colorful costumes with beautiful ornaments and accessories. When I went outside, I saw the queue was not moving so I got curious and asked people around and told me that the parade was blocked in the area close to the city hall. I rushed to the site and saw people were bariccaded with dumbtrucks and army trucks. I saw some military and police men lined up to prevent the parade to continue. According to the people from the city that they had no permit to pass through the city hall and they should take the route prescribed on their permit. It was a standoff for nearly two hours. In the afternoon, a showdown of the various municipalities of their festivals was exhibited. Each and every contingent’s performance was so fantastic. Its like you have traveled the entire province witnessing their rich cultural heritage. I even had to escape the event since I want to attend the Feast of Perpetual Help celebration at the Redemptorist Church but it was unfortunate that it was done a week ago. I just met Fr. Edwin Bacaltos the following day when I attended the mass. The said festival was such an exciting and unique festival I ever covered due to an issue but nevertheless it was worth my visit because it was highly satisfactory. A festival like this should be preserved and be continued for the next generations to come. The National Commission for Culture and the Arts (NCCA) called the representatives of cultural communities in northern Luzon on July 19, 2011 at Intramuros Manila for orientation meeting and election of officers. In the morning session there was the election of officers for the clusters of Iloko/Bago, Bolinao/Pangasinense and the Tagalog/Kapampangan. The head of the 15 clusters will serve as members of the Executive Council of the National Committee of Northern Cultural Communities (NCNCC) for a term of three years.